I've mentioned Kickstarter on here a few times before. It's basically a crowd funding platform for creative projects. If the project reaches it's target amount then it flies, if it doesn't then the project receives zero of the pledged funding. You are rewarded for your donation depending on how much you pledge. So Vincent Moon, the brains and genius behind the blogotheque 'take away' shows (Les Concerts à Emporter) has set up a Kickstarter project called 'From ATP'. 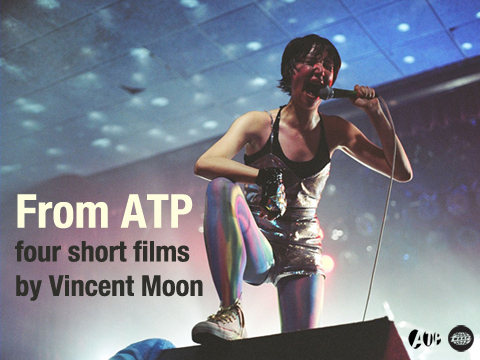 "Vincent Moon (the Take Away Shows) went to ATP as a fan on numerous occasions documenting his experiences each time. Some of his footage was used in the fan-sourced feature documentary All Tomorrow’s Parties (directed by All Tomorrow’s People and Jonathan Caouette - http://warp.net/films/atp). That film was completed and released in 2009 but Vincent continued to return to the festival and shoot as a fan, running around the site capturing the unique atmosphere and some incredible performances in his own inimitable style. The edit for his first stand-alone short film was completed last year and the footage for the next 3 short films is in the can. Please help us complete post-production so we can get the films out into the world for free (after an exclusive 3 month period where they’ll be available for contributors only). With your help we will edit a further trilogy of short films (each one approximately 30 minutes) in order to complete this unique project. Bands documented, and intended for the final films (subject to clearance) include Broken Social Scene, Explosions In The Sky, Four Tet, Animal Collective, The National, Saul Williams, Monotonix, Fantomas, Taraf De Haidouks, Teenage Jesus And The Jerks, Rahzel, the Yeah Yeah Yeahs, Afrirampo, Sleepy Sun and many others. Legal work, permissions and clearances for music and artists included in the films. Sound mixing and post production. Hard drives for the footage and web hosting fees for the eventual video. If you want to get involved in helping to get these films finished and released, check out the Kickstarter page now to see a trailer and get more info. You can pledge anywhere from $1 to $5000, and you will receive special rewards for your contribution - from CD’s, DVD’s & Posters to film credits, festival tickets and your own personal film, made for you by Vincent Moon, anywhere in the world. " If you interested you can get involved here.